I’ll try to make us all happy with this size – not too big or too small – and hope you like it too. Center a rack in the oven and preheat the oven to 200°C/400°F. Butter 12 full-size madeleine molds, or up to 36 mini madeleine molds, dust the insides with flour and tap out the excess. Or, if you have a nonstick pan (or pans), give it a light coating of vegetable cooking spray. If you have a silicone pan, no prep is needed. Place the pan(s) on a baking sheet. Spoon the batter into the molds, filling each one almost to the top. Don't worry about spreading the batter evenly, the oven's heat will take care of that. Bake large madeleines for 11 to 13 minutes, and minis for 8 to 10 minutes, or until they are golden and the tops spring back when touched. Remove the pan(s) from the oven and release the madeleines from the molds. Transfer the cookies to a rack to cool to just warm or to room temperature. If you are making minis and have more batter, bake the next batch(es), making certain that you cool, then properly prepare the pan(s) before baking. Oh my! Whatever size the photos, they are gorgeous. 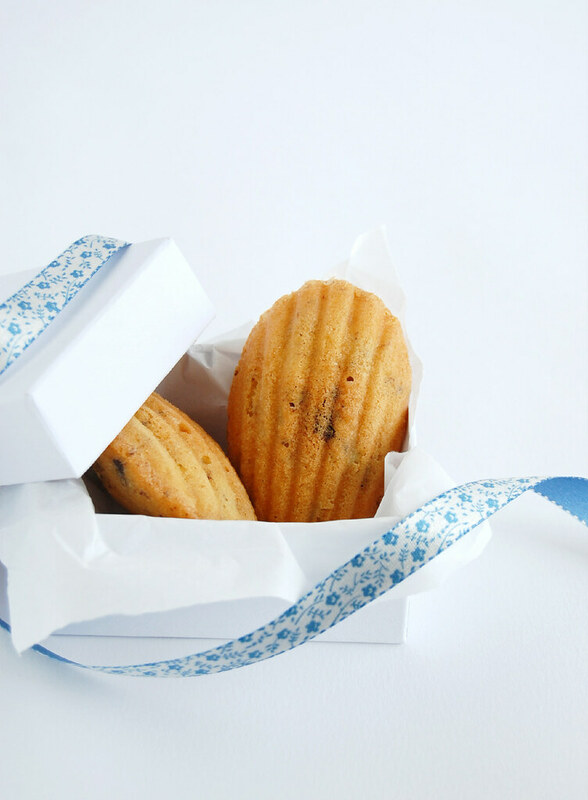 And the madeleines look delicious. I love the addition of chocolate chip in these! Yes, bigger photos are definitely better coz we could see this gorgeous specials made by you :). this size of photos is great and your madelines are amazing with these chocolate chips! I'm sharing this post with my husband, our resident madeleine maker. Hope he gets the hint! The queen of madeleines strikes again! These look wonderfully delicious. Beautiful as always, no matter the size! And I love the idea of flavored madeleines. 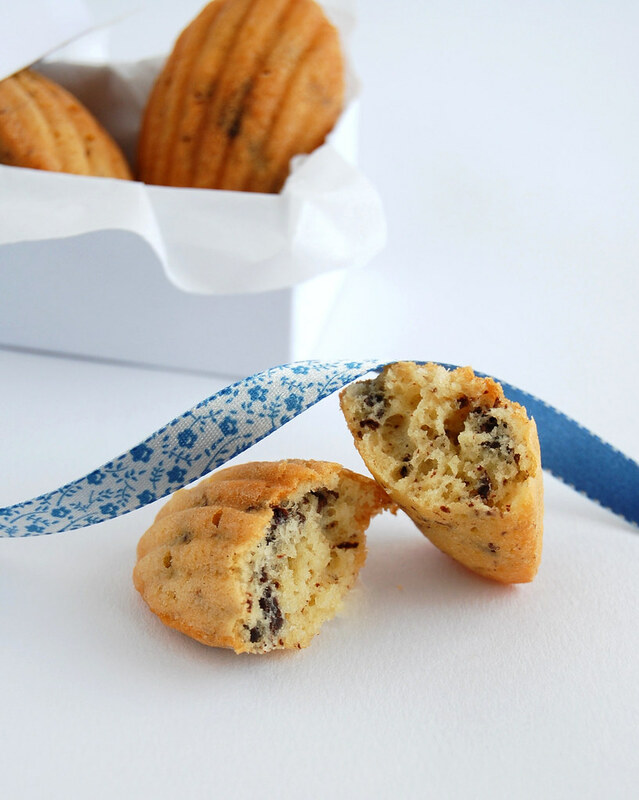 Thanks for sharing how to make these lovely choco chips! My kids will definitely love these! Jen, thank you, sweetie! I made them for a friend and she loved them! BNDQ8, thank you for stopping by! And I like the idea of using white chocolate, yum! Cooking Art, thank you for your feedback! I'm glad you like the madeleines, too! Mark, you are just too sweet, my friend - thank you! These look so nice, I've been meaning to make madeleines for almost a year now - I think this may be the first recipe I try! Made them this morning and they are delicious! Taranii, hope you like these! Emma, that is such great news - thank you for letting me know! I have had on luck with madeleines. I am going to have to try these. They look AMAZING! Since making some madeleines last weekend, I have had them on my mind ever since. These look great! I think I'll have to whip these up tomorrow. Susan, I hope you like them, sweetie! Abby, let me know how they turn out for you? Tks for stopping by! looks so beautiful. Nice Blog.